I found another neat thing to do with a cd4011. Feed a third gate from a standard square wave oscillator through a cap and 2 resistors to ground or rail. Set one for min and one for max pulse width in series then add a Jfet as a voltage controlled resistor across one to vary the pulse width. All the gates were operated as inverters. The system I talked about above worked as well but I had to use a op amp as a comparator to remove the stair step. OK What I have done is much simpler than your diagram. I tried to use a single gate. I have one long pulse connected directly to one input of one gate . From the output I used a 10k pot and connected it between the output and the second gate. Then I added a .01 cap from that same gate to the supply so when the gate goes low it will slowly bring the second input low and send the output high again. It might be too simple and I may need more parts but I need two pulse shapers and I am trying to do this with only one chip. The other two gates are used for the main oscillator. I did manage to get what I wanted using a comparator to clip the bottom of the pulse but I just thought it work be better if I didn't have to do that. I was trying to use a Nand gate as a PWM. I have a high pulse and I put it on one input then used an RC from the output to the other input to shorten the output. What I get out is a stair step with the first part to negative and then it rises to half the supply until the main pulse times out. 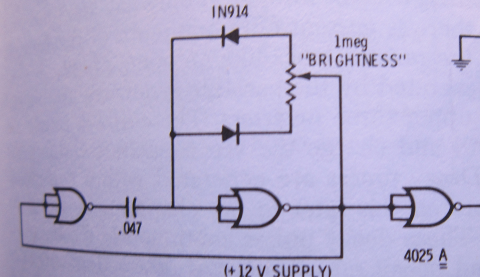 I had the cap with one end tied positive and the resistor to the output. Is there a way I could eliminate the stair step to get a clean square pulse out?